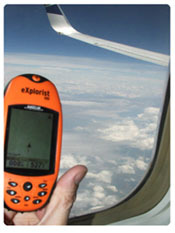 Magellan - explorist100 satellite handheld GPS unit is powerful, affordable GPS with track-plotter. 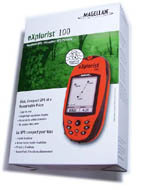 Explorist-100 provides reliable accuracy to within 3 meters. Save track logs to guide you to your favorite spots. Back Track will lead you to camp, the car and home. Magellan® eXplorist™ 100 is the first GPS handheld to provide sub three meter accuracy at a price under $100 USD. This is a great value for recreational explorers to use when hiking, climbing, camping and geocaching. Magellan TrueFix technology incorporates 14-parallel-channel, WAAS/EGNOS-enanbled GPS receiver providing accurate satellite signal acquisition and tracking for precise position fixes within three meters. It has a tough rubber armor shell that is impact resistant and waterproof, it also saves up to 500 waypoints, 20 routes and three track-log files with up to 2,000 points each. It weighs less than four ounces and measures 4.6 x 2.1 x 1.3 inches, it uses a 2.3-inch diagnol, four shade grayscale LCD with zoom capabilities and amber backlighting. The Magellan eXplorist 100 is bright orange and kind of chubby and rounded compared to Magellan's SporTrak series. It has 8 buttons on the front and one on each side near the top. The unit is surrounded by a strip of rubber for good gripping and a little style. The battery compartment is secured by a "D" ring that you turn 4 times to open or close. The battery compartment is also gasketed, as the unit is waterproof to one meter for 30 minutes. One of the buttons on the front of the unit is a joystick type which is handy for getting around in the menus. Out-of-the-box satellite acquisition time was about 80 seconds. After that, cold starts were about 40 seconds. Satellite strength was good with my eXplorist 100 receiving signals from 9 satellites at times. Right now on my desk the unit is receiving 4 satellites for a 3D fix. And my desk is inside the building where most desks usually are. One test was to take a walk and then use the "GOTO" to guide me back home. Estimated accuracy got as low as 10 feet. As this is a very basic receiver, there was not a whole lot of information displayed as a result of the GOTO. The map page showed a straight line from my current position to the home location. It also shows the bearing numerically and the distance to go. But after all, that is really all you need. Upon reaching my destination, the distance to go was within 20 feet of being correct. The Magellan eXplorist 100 GPS is basically the eXplorist 200 minus the base map. It shares the same lack of a PC interface. Unlike most GPS receivers, you cannot transfer waypoints, tracks and routes between it and your PC. All coordinates must be entered manually. Magellan's pocket-sized eXplorist 100 recreational GPS receiver is both powerful and affordable. This inexpensive unit has a sleek yet durable design and a bright orange and black housing that makes it easy to find against most any background. With its rubber armor, impact-resistant plastic, and water-resistant case, you can confidently take your eXplorist 100 on any and every adventure. 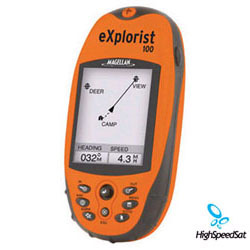 The eXplorist 100 features Magellan's TrueFix technology, which takes advantage of 14 parallel channels, supported by WAAS and EGNOS for fast signal acquisition, minimal signal loss, and reliable accuracy to within three meters. This handy GPS unit lets you save up to three track-log files each with up to 2,000 trackpoints, 500 points of interest, and 20 routes to guide you back to your favorite spots or, more importantly, to your car or home. Magellan Products - Auto, handhelds, fitness, portable gps devices and accessories. How GPS works? - A lot of details about GPS system. GPS satellites - NAVSTAR, satellite constellation, USCG Navigation Center and more! GPS Satellite Forum - Raise a topic with other GPS enthusiasts about products, software, applications or adventures.